Aikido represents the highest expression of Japanese Budo or martial arts. More than being an effective (if not the most effective) form of self-defense, it is also strongly based in a moral perspective almost unknown in the world today. The idea is that there two basic forms of thought in the Japanese martial arts - "satsujinken" and "katsujinken" (the sword that kills and the sword that preserves life). AIKIDO - Refined Jujitsu style unarmed combat techniques against one or more opponents. Aikido's sharpness of body movement comes from the art of the Japanese sword, and it's flexibility and smoothness comes from the art of the Jo. KENJUTSU - Japanese sword techniques of drawing, cutting, timing, and strategy against one or more opponents. JOJUTSU or JODO - Japanese short staff techniques of thrusting, sweeping, striking, take downs and immobilizations against one or more opponents. 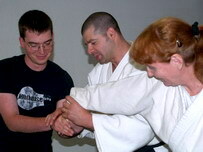 Seikikai also offers an instructor training program. This program is fully sanctioned and supported by Kurita Sensei who is recognized by the Japanese government as a master of the art. Kurita Sensei verifies all ranks and certificates are issued and recorded at the Seikikai Hombu Dojo in Japan. Testing is done approximately every 3 months. As a rule, adult students test about every other time. The Chief instructor based upon criteria established by the home office in Japan and information of each individual student and their various life circumstances determines those testing. Call us today at (360) 279-9276. 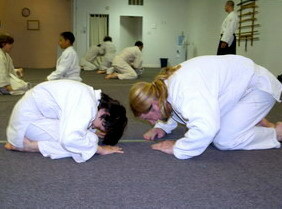 The best way to understand this style of training is to go on the mat and and have experience it first hand. The classes are interesting and challenging. But, you are able to work at your own pace. There is no rush and the senior students have a vested interest in making sure you learn and enjoy - their progress depends on it. These techniques are non-competitive, but you test in order to gain rank. 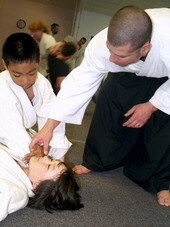 Classes are structured according to Japanese tradition and are taught using Japanese terminology. When you enter, and periodically during your pursuit of Aikido, you will have the opportunity to consult with the instructors regarding your personal progress and how to achieve the most from your training. In feudal Japan one could take a defense position to the extreme and cause extreme harm. Though techniques can used this way today, our goal in training is to make oneself skillful without injuring another. Safety is stressed at all times in class. This site was designed by Whidbey Web Works and last updated 16 July 2008. All individuals featured in this website have released these images to Aikido Seikikai.